We're nearing the end now, with only a few chapters to go. The dwarfs learn of the fall of Smaug and of the forming armies. Wisdom also comes from an ancient raven (not crow, which are "nasty suspicious looking creatures"), advising the party to not trust the Master of Laketown, but that Bard will meet them true, and that peace may cost dear in gold. As we might expect, Thorin gets angry at the messenger. Dragons and dwarfs are not so different when it comes to guarding gold, and the last chapter shared how dwarven courage and pride is inflated by riches. 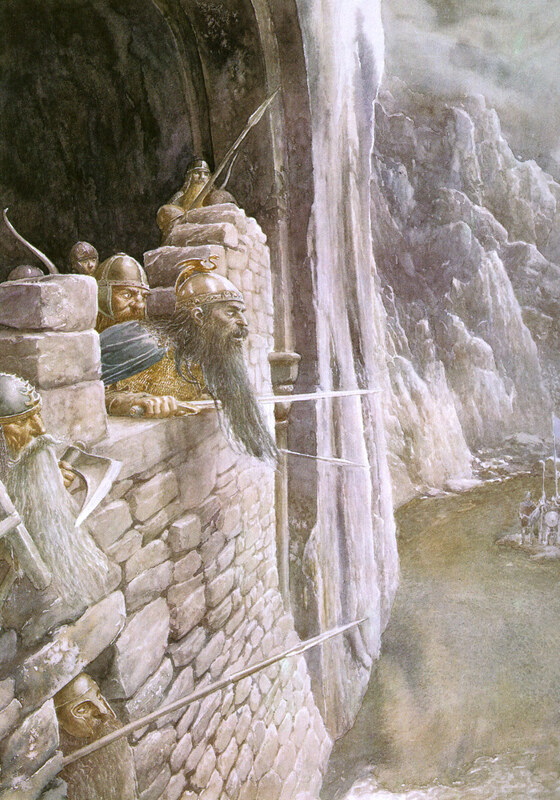 Again we get dwarven music, "much like the song they had sung long before in Bilbo's little hobbit-hole," but about might and power not seeking to reclaim a home long lost. Point of note - this can be sung to the same tune(s) as the Misty Mountain song. Bilbo, is right to note the change in sound, singing of "foes shall fall," is a departure from their starting goals and intent. I've complained a lot about the over-blown nature of Thorin's dragon-madness in the films by now, but this is the first time we really see the "the power that gold has upon which a dragon a dragon has long brooded." Greed and pride (from the dragon gold specifically, not his bloodline) overwhelms Thorin, deafening him to any legitimacy of claims against the hoard and to the true need of the men of Laketown. Instead all Thorin sees is armed invaders coming to steal his wealth. There is a chance that reason may have gotten through to Thorin eventually, but then someone had to go mess things up by demanding a full 1/12 of the treasure. The men of Laketown came with a very legitimate claim, that Smaug looted their ancestral wealth in addition to the dwarfs'. But demanding that much of the treasure is pretty much a joke. Even were the dwarfs willing to part with such a portion, sorting it out and handing it over the next morning isn't even close to possible. And so starts the seige. The movie has a scene titled sharing this chapter's title, where Bard attempts to treat with the dwarfs. At this point, I've literally skipped multiple scenes since I'm watching the movie piecemeal in trying to follow the plot of the book, some reasonably out of order since there's a whole lot of backfilling in the book, and others which are more gratuitous. Touching on that briefly, this is where I start liking Thrandil, though he doesn't hit "sassy queen" until later. He brings aid to the men of Laketown, but also for his own desires, which matches behavior from the novel. The exchange between Bard and Thorin is well scripted, built out in a way that adds to the story. The exclusion of the music is tragic, especially as I am dying to know if it would have been set to the same tune as the Misty Mountain song (it matches perfectly), but the scene was focused in on Bard and Thorin, rather than two hosts facing off. For once Thorin isn't acting in a pure fog of dragon-lust, but we see the internal conflict, and reasons beyond greed for the dwarfs to grudge aid to Laketown. "What choice did we have? To barter our birthright for blankets and food? To ransom our future in exchange for our freedom? There is anger here, the anger of the displaced and the exploited, we know from earlier chapters that their lives were not necessarily easy in the years since the dragon came. The resentment comes not from just a long over-worn grudge against anything associated with elves nor from an all-consuming lust for gold. 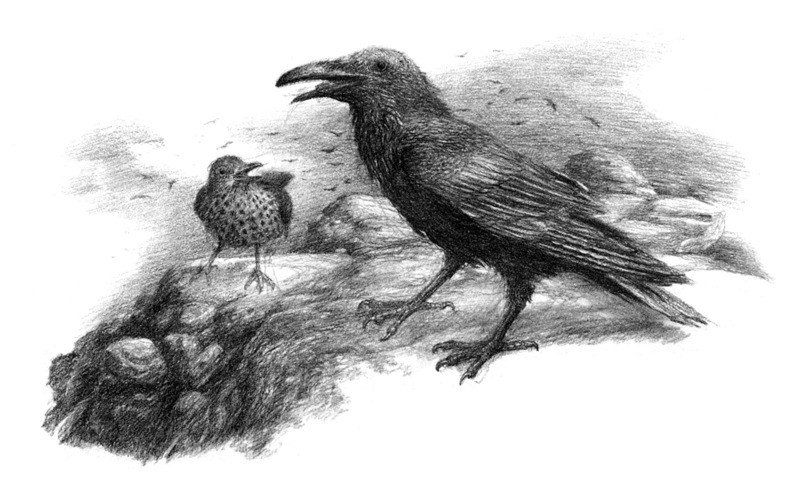 Also of note, while we don't get the actual conversation with the thrush or the crows, we see the messenger bird fly off to the army of Dain. Now finally we see the mirthril chainmail, perhaps well fitted within an arming montage of both dwarfs and men, though nearly ruined by a resurgence of Thorin's overly dramatic dragon-madness inspired paranoia. I think at this point Jackson is going for more than just all-consuming lust for gold. The change of voice and demeanor isn't just reminiscent of Smaug, but that of Smeagol and others effected by the presence of the ring. And spoiler: Gandalf returns while the armies of men and elves prepare for war. Alfred is an jackass (no surprise there), elves are arrogant, and nothing is achieved. I really wish that the decision had been made to hold off on the reveal of Gandalf's return until the events in next chapter. It takes away some of the delight of the moment.